← Is Google’s Android Sponge Worthy? 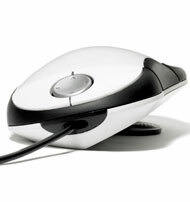 In case you missed it, I recently tried out a new ergonomic mouse for The New York Times. It's an odd confection of design elements, but it may save your wrist. For more on the Humanscale Switch Mouse, check out the story here. This entry was posted in Uncategorized and tagged ergonomic mouse, humanscale, quain, switch mouse. Bookmark the permalink.